Scotland Run South Jersey Wedding. We began our day at Scotland Run Country Club, a spectacular venue located in Williamstown, New Jersey. This venue offers a beautiful Wedding Pavilion and Garden overlooking the grounds. It’s a perfect location for an outdoor ceremony and we consider it one of favorite venue in South Jersey. The gorgeous landscape and beautiful pergola is one of our favorites. It is covered with flowering wisteria and the winding brick walkway adds to the charm. The array of seasonal flowers also adorns the grounds and adds to the colorful and vibrant photographs we always enjoy photographing. In this photo the couple was standing outside on the balcony of the venue. 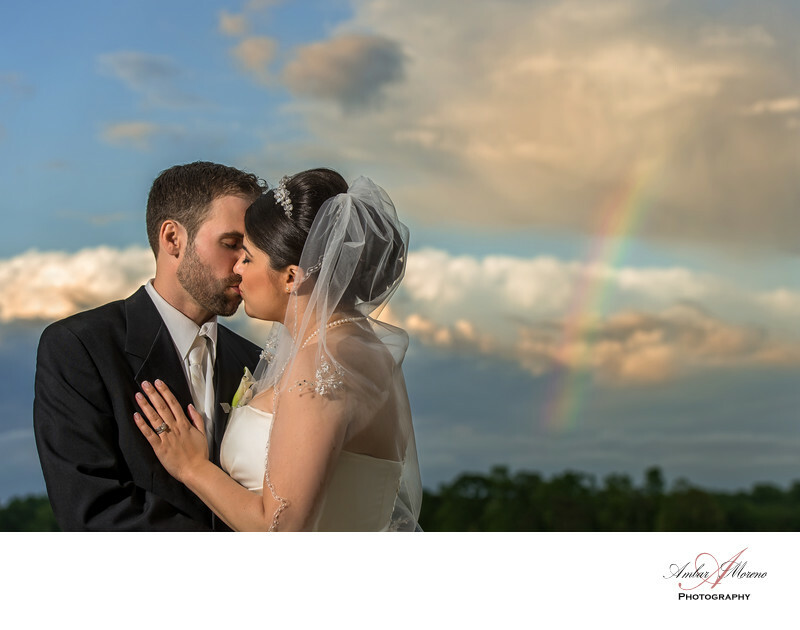 As the sun began to set, I noticed a beautiful rainbow forming in the distance. It was the perfect backdrop for the couple. The golden setting sun illuminated them and the clouds in the distance. It was a perfect scene that I was able to capture again. The ballroom is grand and with a stunning view overlooking the amazing golf course. It’s a photograph that we enjoy capturing every time as the sun sets. We love spending time outside capturing stunning photos of the skyline, which vary in color depending on the weather and it adds to the mood of the photo. We also can’t forget the tranquil pond with its waterfall that is nestled next to the pergola. It’s a quite location where we take couples to be photographed. The photo opportunities at this venue are vast and regardless of the number of times we photograph a wedding at Scotland Run, we are guarantee to come up with beautiful and creative photos every time. Location: 2626 Fries Mill Road, Williamstown, NJ.